People are being warned to stop using a weight loss pill sold over the internet and in Chinese medicine shops. The Medicine and Healthcare products Regulatory Agency (MHRA) has issued a warning about Herbal Flos Lonicerae (Herbal Xenicol). Anyone taking the product should stop immediately and contact a doctor, it says. The warning comes after reports of side effects such as palpitations, with one patient needing hospital treatment. The capsules are thought to contain an as yet unknown pharmaceutical substance. Tests are underway to establish the cause of the side effects. By April this year, under a European directive, all manufactured herbal medicines will have to be registered under a new scheme to prove they meet safety and quality standards. The scheme is known as the Traditional Herbal Registration (THR). 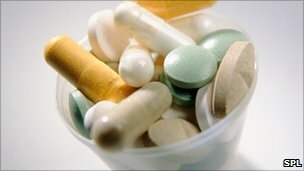 Richard Woodfield, head of herbal medicines policy at the MHRA, said: "Since 2005, the MHRA has found over 280 examples where so-called 'herbal' or 'natural' products have been adulterated with random quantities of powerful pharmaceutical substances. Such products pose a real risk to the public. "It is situations such as this one that the THR scheme is being introduced and why EU legislation has been changed in order to regulate herbal medicines. "People have a right to know that what they are putting into their bodies to treat one condition will not directly cause a possibly more severe one simply as a result of very poor practice in parts of the sector. "The THR scheme will make it possible to give people clear advice on which herbal products are safe to use, and provide an assurance that they were made in adequate conditions, and to the necessary standard."